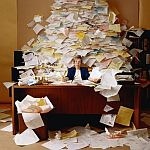 As managers we must deal with a lot of paperwork and information from a variety of sources. Without a good information management system you can have a hard time finding something when you need it. The system detailed here will take all the data on a specific subject and put it in one easy to reach and portable place. Project meetings, staff meetings, vendor meetings. Think of all the meetings you go to and all the paperwork that you have that deal with a specific topic. Do you ever find yourself scrambling to find notes from a meeting? Wouldn’t it be nice to pull out one folder pocket containing all the information on a topic before you make an important phone call? This is where a good information management system comes in. While some of our data is electronic and there are many ways to easily organize it, there are drawbacks. For one electronic data is not always portable so you can’t easily carry it with you to meetings. Regardless of how much we try to be green and go paperless, we still end up with a lot of information on paper we must deal with. A folder based information management system works well for managers who deal with a number of projects and tasks. It allows you to combine all the information you have about a particular subject in a set of folders which is then placed in one expanding file pocket. A file pocket is expandable so it can hold all of your file folders and loose pieces of paper about a single subject. You can store it in your regular file cabinet and grab it on the way to a meeting or when you need to quickly access all of your information on that subject. Think of all the information you have about different projects and tasks. For example let’s use a vendor selection process to replace your current router. You will create different folders that will hold different types of information. All of these folders are placed in a folder pocket named “Replacement Router Project”. Now when you go to a meeting, take or make a phone call, create an email or need any documents related to this project you have all of your information in one place. A green note here. This is a system that is paper based. You should only print out documents you need to be portable. Whenever possible use the electronic version if one is available. Any important documents that do not have electronic versions should be scanned so they can be archived. A folder pocket based information management system has many benefits. No more hunting for paperwork! This is a very simple solution to an often frustrating problem. You may already have folders with such documents in your filing system. Using a folder pocket both consolidates and makes it portable.